what's cooking tonight: roasted baby carrots with shaved sunchokes & chives in truffle oil. I'm an ad-hoc cook in every way. I cook with whatever happens to be in my fridge, pantry, or garden. I'm an expert at taking foods that are on their last breath, and giving them a nudge in the right direction [a direction that usually ends in something delicious]. Yesterday, while cleaning out the fridge, I discovered a couple bags of baby carrots that I'd completely forgotten about. They looked surprisingly okay, but just a bit dry. 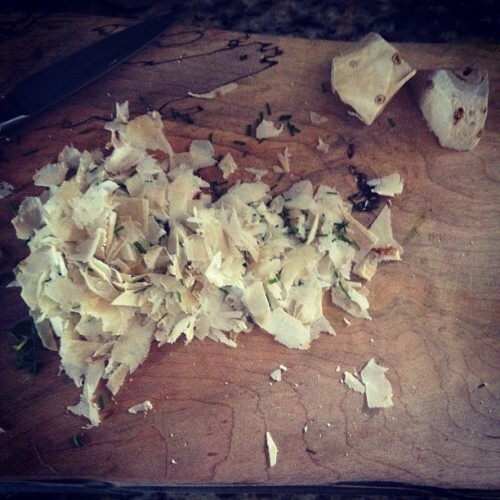 There was also a hunk of sunchoke [also known as the Jerusalem Artichoke- for more on the etymology, check this out] that's been sitting in my fridge for a while now and desperately needed to be used [I hate wasting anything, especially weird vegetables I spend too much money on]. I took a peek at the garden y chive plant needed a haircut- she was starting to get split ends, so that got added to the jumble. 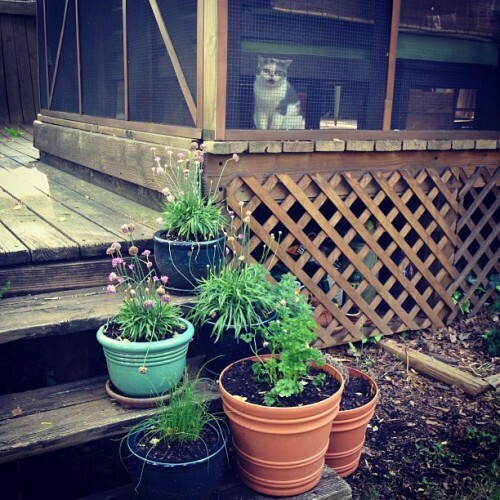 You can see a the chives in the navy pot at the bottom of this photo, though they've since been moved to a sunnier spot on the deck. I just wanted to use this shot because it has Maggie crying in the background. Finally, I've been craving anything with truffle oil for the last few days [a little odd, yes] since the talk of truffle mac and cheese has come up in conversation recently, so I thought I'd figure out a way to incorporate it into tonight's meal [without making the mac, since I'm pathetically out of pasta]. I've never cooked with this combination of ingredients before, but figured with four ingredients, you can't go too far in the wrong direction. I decided to shave the sunchoke, since it was a bit on the soft side, and it reminded me of ginger, which is always good with this application. I preheated the oven to just 375F. Because I shaved the sunchoke, I wasn't sure how quick it would roast, so I lowered my usual roasting temperature to compensate. I'm going to watch this recipe closely and see how long it takes to cook, but I'm assuming 30-45 minutes. Since I haven't made this before, I'll update this post with how it goes and any changes I'd make to the recipe. In the meantime, I'm off to record something called 'Jitterbug Zombies' with some friends. [details to follow]. In "baby carrots", "chives", "cooking", "dinner", "mandoline", "recipe", "roasted carrots", "side dish", "side", "sunchokes", "truffle oil"